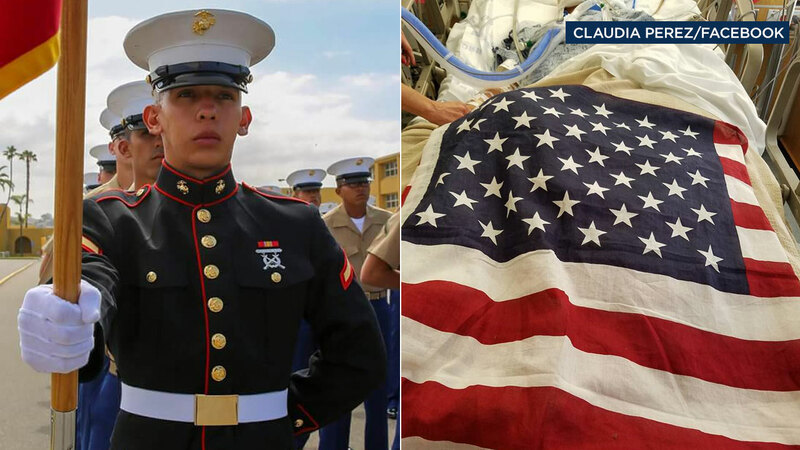 LOS ANGELES -- The 19-year-old U.S. Marine who was shot in the head while on military leave in Los Angeles last week has died, officials said. The coroner's office received a call from the Dignity Health California Hospital Medical Center at 2:30 a.m. Tuesday reporting the death of Carlos Segovia. According to Los Angeles police, Segovia was shot once in the head near 31st Street and Western Avenue at around 11:30 p.m. Friday. Segovia was in his car at a stop sign when another vehicle pulled up, and a suspect or suspects opened fire. After numerous tests, doctors said Segovia's brain injury from the gunshot was irreversible and declared the young Marine brain dead on Sunday. "This young kid never had any sign of neuro function at all. He had a gunshot wound that entered the base of his left skull, took out his major vessel," said Dr. Gudata S. Hinika. Segovia was not in uniform when he was shot, according to authorities. The family of Segovia said the 19-year-old was home on military leave from Camp Pendleton. For several years, Segovia volunteered for a group that feeds the homeless, and six months ago, he became a U.S. Marine to serve the country he loves, his family said. An undated photo of 19-year-old Carlos Segovia volunteering to help the homeless. His loved ones are pleading with the public to help find who killed Segovia. "I know Carlos wants justice, you know, and we want him to get justice. It just can't be just a mystery crime in South L.A., someone got shot in the head and blah, blah, blah," said Claudia Perez, Segovia's friend.